Homeostasis is the relative constancy of the body’s internal environment. Because of homeostasis, even though external conditions may change dramatically, internal conditions stay within a narrow range. For example, regardless of how cold or hot it gets, the temperature of the body stays around 37°C. No matter how acidic your meal, the pH of your blood is usually about 7.4, and even if you eat a candy bar, the amount of sugar in your blood is just about 0.1%. It is important to realize that internal conditions are not absolutely constant; they tend to fluctuate above and below a particular value. Therefore, the internal state of the body is often described as one of dynamic equilibrium. If internal conditions change to any great degree, illness results. This makes the study of homeostatic mechanisms medically important. Negative feedback is the primary homeostatic mechanism that keeps a variable close to a particular value, or set point. A homeostatic mechanism has three components: a sensor, a regulatory center, and an effector (Fig. 1.7a). The sensor detects a change in the internal environment; the regulatory center activates the effector; the effector reverses the change and brings conditions back to normal again. Now, the sensor is no longer activated. A home heating system illustrates how a negative feedback mechanism works (Fig. 1.7b). You set the thermostat at, say, 68°F. This is the set point. The thermostat contains a thermometer, a sensor that detects when the room temperature falls below the set point. The thermostat is also the regulatory center; it turns the furnace on. The furnace plays the role of the effector. The heat given off by the furnace raises the temperature of the room to 70°F. Now, the furnace turns off. Notice that a negative feedback mechanism prevents change in the same direction; the room does not get warmer and warmer because warmth inactivates the system. Figure 1.7 Negative feedback. In each example, a sensor detects an internal environmental change and signals a regulatory center. The center activates an effector, which reverses this change. a. The general pattern. b. A mechanical example. c. A human example. Negative feedback mechanisms in the body function similarly to the mechanical model. For example, when blood pressure falls, sensory receptors signal a regulatory center in the brain (Fig. 1.7c). This center sends out nerve impulses to the arterial walls so that they constrict. Once the blood pressure rises, the system is inactivated. The thermostat for body temperature is located in a part of the brain called the hypothalamus. When the body temperature falls below normal, the regulatory center directs (via nerve impulses) the blood vessels of the skin to constrict (Fig.1.8). This conserves heat. If body temperature falls even lower, the regulatory center sends nerve impulses to the skeletal muscles, and shivering occurs. Shivering generates heat, and gradually body temperature rises to 37°C. When the temperature rises to normal, the regulatory center is inactivated. When the body temperature is higher than normal, the regulatory center directs the blood vessels of the skin to dilate. This allows more blood to flow near the surface of the body, where heat can be lost to the environment. In addition, the nervous system activates the sweat glands, and the evaporation of sweat helps lower body temperature. Gradually, body temperature decreases to 37°C. Positive feedback is a mechanism that brings about an ever greater change in the same direction. A positive feedback mechanism can be harmful, as when a fever causes metabolic changes that push the fever still higher. Death occurs at a body temperature of 45°C because cellular proteins denature at this temperature and metabolism stops. Still, positive feedback loops such as those involved in blood clotting, the stomach’s digestion of protein, and childbirth assist the body in completing a process that has a definite cutoff point. Consider that when a woman is giving birth, the head of the baby begins to press against the cervix, stimulating sensory receptors there. When nerve impulses reach the brain, the brain causes the pituitary gland to secrete the hormone oxytocin. Oxytocin travels in the blood and causes the uterus to contract. As labor continues, the cervix is ever more stimulated, and uterine contractions become ever stronger until birth occurs. 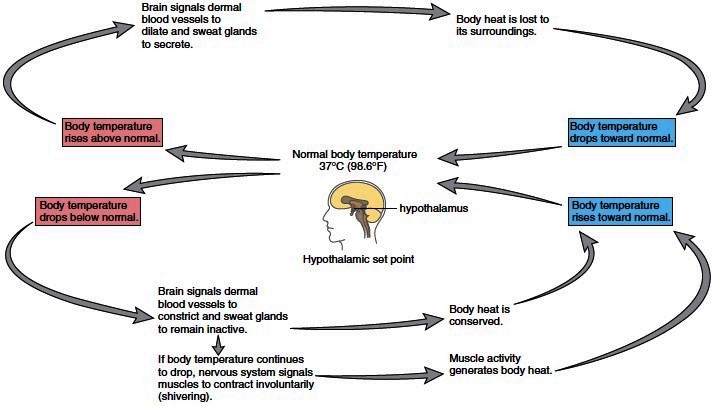 Figure 1.8 Homeostasis and body temperature regulation. Negative feedback mechanisms control body temperature so that it remains relatively stable at 37°C. These mechanisms return the temperature to normal when it fluctuates above and below this set point. This action is assisted by the white blood cells that are housed within lymph nodes. The respiratory system adds oxygen to and removes carbon dioxide from the blood. It also plays a role in regulating blood pH because removal of CO2 causes the pH to rise and helps prevent acidosis. The digestive system takes in and digests food, providing nutrient molecules that enter the blood and replace the nutrients that are constantly being used by the body cells. The liver, an organ that assists the digestive process by producing bile, also plays a significant role in regulating blood composition. Immediately after glucose enters the blood, any excess is removed by the liver and stored as glycogen. Later, the glycogen can be broken down to replace the glucose used by the body cells; in this way, the glucose composition of blood remains constant. Figure 1.9 Regulation of tissue fluid composition. 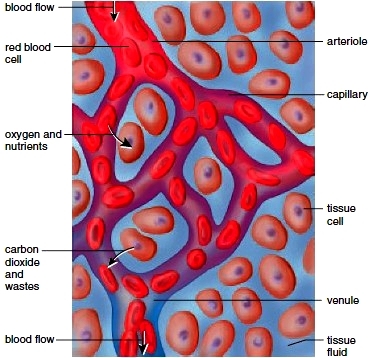 Cells are surrounded by tissue fluid (blue), which is continually refreshed because oxygen and nutrient molecules constantly exit the bloodstream, and carbon dioxide and waste molecules continually enter the bloodstream. The liver also removes toxic chemicals, such as ingested alcohol and other drugs. The liver makes urea, a nitrogenous end product of protein metabolism. Urea and other metabolic waste molecules are excreted by the kidneys, which are a part of the urinary system. Urine formation by the kidneys is extremely critical to the body, not only because it rids the body of unwanted substances, but also because urine formation offers an opportunity to carefully regulate blood volume, salt balance, and pH. The integumentary, skeletal, and muscular systems protect the internal organs we have been discussing. In addition, the integumentary system produces vitamin D, while the skeletal system stores minerals and produces the blood cells. The muscular system produces the heat that maintains the internal temperature. The nervous system and the endocrine system regulate the other systems of the body. They work together to control body systems so that homeostasis is maintained. We have already seen that in negative feedback mechanisms, sensory receptors send nerve impulses to regulatory centers in the brain, which then direct effectors to become active. Effectors can be muscles or glands. Muscles bring about an immediate change. Endocrine glands secrete hormones that bring about a slower, more lasting change that keeps the internal environment relatively stable. Disease is present when homeostasis fails and the body (or part of the body) no longer functions properly. The effects may be limited or widespread. A local disease is more or less restricted to a specific part of the body. On the other hand, a systemic disease affects the entire body or involves several organ systems. Diseases may also be classified on the basis of their severity and duration. Acute diseases occur suddenly and generally last a short time. Chronic diseases tend to be less severe, develop slowly, and are long term.